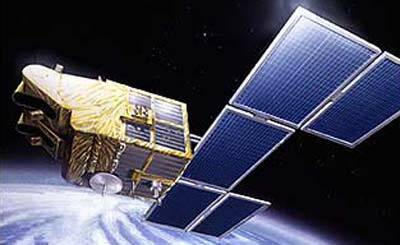 The satellites SPOT 5 (Satellite Probatoire de l'Observation de la Terre) was a third generation of SPOT earth observation satellite operated by Spot Image. SPOT 5 used the improved SPOT Mk.3 bus design. The prime imaging instrument was HRG (High Resolution Geometric), which was built by Astrium SAS of Vélizy, France to continue to improve the HRVIR service of SPOT-4. Two HRG instruments are provided in the conventional SPOT-series double-observation configuration, each with a FOV of 4.13º and the same cross-track pointing capabilities of ±27 º as the HRVIR imager on SPOT-4. The observation coverage of each HRG is 60 km in the nadir direction and >80 km in the oblique configuration. SPOT-5 carries also the HRS (High Resolution Stereoscopic) instrument, which was developed and built by EADS Astrium SAS, sponsored by CNES and SPOT IMAGE. The objective of this instrument is to provide large-area along-track stereoscopic panchromatic imagery with good altimetric accuracy (5-10 m relative and 10-15 m absolute). Applications of the stereo imagery are seen in various fields such as map making and in the generation of DTMs (Digital Terrain Model) The panchromatic band (0.51-0.73 µm) of SPOT-1, -2, -3 is being reintroduced. The HRS instrument features two telescopes allowing a 20º fore view and a 20º aft view over a 120 km swath, respectively. A spatial resolution of 10 m is provided in cross-track and 5 m (parallax direction) in along-track. The stereo acquisition mode can be sustained for scene lengths of up to 600 km. HRS uses the same CCD line detector design as for the HRG instrument. An additional sensor for SPOT-5, called Vegetation or VMI (Vegetation Monitoring Instrument), with a ground swath width of 2200 km, and a resolution close to 1 km, providing the capability of wide-area monitoring of the Earth's vegetation. The instruments features advanced optics that allow perfect geometrical rectification of the pictures despite the wide swath width, as optics virtually cancel the curvature of the Earth to provide directly usable geographical information. It is copy of the SPOT-4 instrument with minor improvements. SPOT 5 was orbited on 4 May 2002 on an Ariane-42P H10-3 rocket.